As of April 2018, there are half a million active podcasts with over 18 millions episodes. Almost half of the American audience listens to podcasts regularly. This means that there are a lot of people who believe in the power of audio content, and a lot of fans and listeners who support this belief. Even in such a huge market, podcasts are one of the best tools for reaching a specific audience and promoting your brand. In short, podcasting may help you increase traffic, build a better relationship with your audience and at the same time, increase your engagement and drive more leads. However, it is not enough to simply record and post your episodes, just as it’s not enough to write and post articles on you blog. Audio content needs to be distributed and effectively marketed in order for people to hear about it. This is more important than ever, as the podcasting market grows and becomes increasingly crowded. You must understand how to promote a podcast if you want to succeed with this powerful form of content marketing. With so many avenues to market podcasts, I find that Facebook is still one of the top sites and a good place to start. Several top brands are leveraging the community-focused vibe of Facebook to create related content, videos, and even Facebook groups to grow their podcast audience and get their content more exposure. Because it’s always easier to grasp something in a real world scenario, let’s take a quick look at a case study. This is not a major brand, nor a major podcast. I have chosen it because the vast majority of marketers considering starting a podcast will be able to relate. The name of the channel is The Uncensored Growth Podcast. The host decided to give a boost to his newly launched series by running a contest. He took care of every little detail and decided that the best and quickest promotion would be via Facebook ads, as he explains in a blog post. “I needed a quick traction for my contest to get more people to view and sign up for it,” he said. And so he did. Was it worth it? Well, for a small brand it was more than effective. Facebook delivered better results than expected and this was only the beginning. Imagine what you can achieve on this platform if you are dedicating at least a few hours daily to it. What might happen if you promoted not just one episode but each one of them? So how to you promote a podcast on Facebook? What are the most important steps? I won’t go into details on how to create a Facebook Page. I assume that people reading this piece will likely be on Facebook already. There are plenty of resources that will teach you which steps to take and why, like this thorough guide on Facebook Pages from Foundr. Let’s move on to the next important part of your strategy, which is page optimization. Once you’ve set up your Facebook page, it’s time to optimize it in order to make it marketing ready. To create a rock-solid podcast marketing strategy, you need your podcast to actually be a brand. You need a visual identity. You need a name. An idea. The Facebook page artwork and the banner used on the official website are practically the same. There are differences in size, but colors, fonts, and images are all branded. You don’t even have to hire a designer for this task. Use the visuals from your blog or website and adjust them to look better on Facebook. 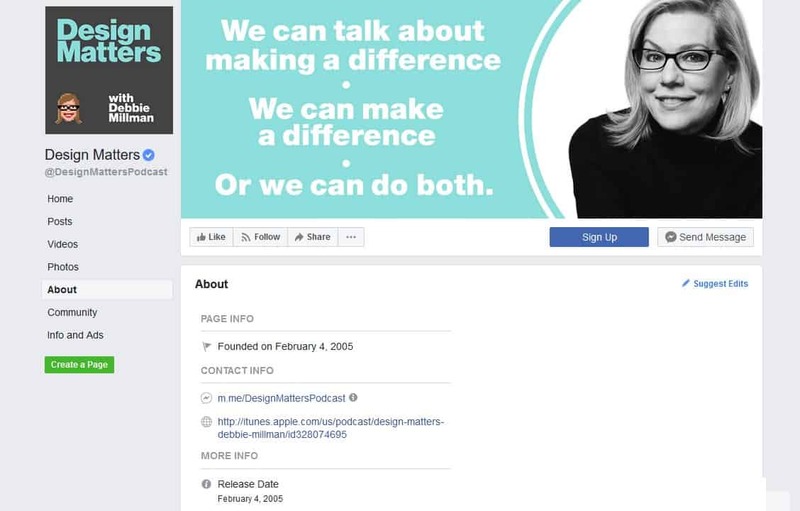 Here’s some tips on creating your Facebook cover photo/banner. Then, optimize the page where you are going to promote your podcast. How? Fill in your “about page” section with all the details related to your podcast. Observe the design, the description and the link to the actual podcast. There are essential items and not-so-essential items here. The essentials list should include the release date, the link to the podcast and a short “About” section that describes in just a few words who you are and what are you doing. You can include some keywords that define your show and the main topics you cover. The quality and the creativity of your content are two of the most important things you need to focus on. They’ll allow you to build a Facebook page that will stand out from the crowd. You need to build a community around your brand, and in order to do so, you will need to create a lucrative content marketing strategy on this channel. Content is king applies to social media too, especially Facebook. Post content that you know will be appealing to your audience, and pair it with relevant content that could promote your podcast and at the same time, grow awareness about it via shares and comments. The easiest way to promote your podcast on Facebook is via a standard post that links to your episode. In this example, Gary Vaynerchuk gives his audience a short description of what he talks about in a Facebook post. First, this serves as a reminder that his episode is live. It also serves as promotional material as well, since the author synthesizes the main ideas of his podcast, which offer reasons to listen for those who are interested. He gives a direct link to the podcast as well, and in order to do so, uses Linkfire. This choice is worth a mention, since Linkfire lets you post multiple links to several podcast streaming channels. Thus, it allows you to give your audience the opportunity to select right away where to access the episode, based on the apps they use most. One of the first and best options you have on Facebook is to create carousel content (a group of images a user can scroll through) in order to promote your podcast. It simply involves uploading a series of images so users can scroll through and get more acquainted visually with what you are posting. What types of images are suitable for a carousel content? The trick is to make the user want to see a bunch of visuals and not to get stuck on the first one. Speaking of visuals, Facebook, like other social media channels, is a visual platform. People react better to images and they understand them more quickly and easily. What types of photos might you use? Behind-the-scenes photos: Share with your audience some of the most interesting moments from your life outside the podcast itself. Tim Ferris always does this and he is one of the most popular podcasters on the scene. Behind-the-scenes image from the Tim Ferris show. It will help you show your audience who you are, what you look like, and that you are a real person. Photos from the recording session: Some people are curious about what happens during a recording session. Share with them some of your best moments. They will help you the same way the “behind the scene” photos will, showing your audience who you are and what you are doing. Check out Chase Jarvis’s example:. Apart from photos, you can also design your own visuals, much like we saw with that Arianna Huffington and Oprah graphic. Some 30.4 percent of marketers have used a similar strategy. 1. Work with a specialized design agency that can deal with all your needs and deliver great graphics for your present and future marketing campaigns. 2. Get your own in-house design team. It will cost you a lot, but it will allow you to save valuable time and effort. 3. Work with freelancers. There are a lot of dedicated platforms such as Freelance.com or Fiverr where you can choose professionals you need. They will cost you less than a dedicated team. 4. Work with design tools yourself, such as the Adobe suite. You need some skills and you may have to take some design courses. 5. If you don’t want to spend money and you don’t want to invest time in learning professional design, you can also design graphics, online. There are several design tools like Canva and Picmonkey that you can use for free or at a minimal cost, with templates and cloud storage. Find a phrase that worth repeating or a smart quote from one of your guests. Put it in a nice frame with an appealing background and share it online. Don’t forget your branded visual elements such as your logo, your colors, your fonts. You can create graphics like this with no experience required using tools like Canva. Polls are an easy and effective way to engage your audience and make them an active part of your podcast. People love to be heard and to know that their opinions count. Make it so. Ask them about the topics they want to listen to you talking about. Ask them about the guests they would like to see interviewed. Ask them about when they listen to your episodes, what platform they use, etc. In order to post a poll in your group, just go to the main page and click on the “Write something” field. Select polls from the menu and voila, you’re already there. Polls are a win-win. First, you please your audience by giving them a voice. Then, you get to put them to work for you. They can give you interesting ideas, they can help you manage your calendar, and of course, find out what topics are most suitable for your podcast. You can promote yourself by choosing to promote others as well. How? By choosing to be part of your community of listeners and fans, and offering them valuable information beyond just promotion. To this end, you can write about your own favorite podcasts, make recommendations, and create lists of your top shows. More than half of today’s brands and businesses that engage in digital marketing are now creating and publishing video content. The trend is understandable, considering that video content is easier to watch and understand, especially on mobile devices. Moreover, 35% of marketers include live video sessions in their content marketing strategies. Considering that Facebook live video has the potential to double engagement rate compared to the traditional video content, we can see why this has become an option. What types of video content should you consider publishing on Facebook? You know how movie trailers are designed to attract the audience by mixing together some of the most intense scenes? You can do the same thing with your podcast, especially if you have an important guest on your next episode. You can even create a mix of some of the most important figures you’ve interviewed, extracting the most quotable lines. Here’s an example from the podcast School Of Greatness. Their snackable video is professionally cut, informative, and appealing to the audience it addresses. You can also simplify your marketing strategy and create a basic teaser video with an inspirational CTA and some great backgrounds. This example, from Social Chain, should help you understand this idea better. These are called transcribed videos because they feature text from the podcast. You can find a tutorial on how to create them here. Another great option is to show some live “behind the scenes” moments from your recording sessions. Remember those stats that showed live videos perform better than recorded ones? Well, it’s time to put this knowledge to work. A good example, in this case, comes from Gary Vaynerchuk. He is always entertaining his followers and fans by live streaming his recording sessions. There are a lot of people who would rather watch a video than listen to a podcast. And people who would rather spend time on Facebook than installing a podcasting app and subscribing to a podcast stream. Can you make them part of your audience? One of the best tools you can use in this case is Wavve.co, a web based app that is easy to use and quite effective. How does it work? Create an account, upload your branded visuals, and select whether you want to use audio waves or progress animation. The audio wave is a graphical video representation of your sound file. According to Tech Terms, it is the “image that represents an audio signal or recording. It shows the changes in amplitude over a certain amount of time. … Most audio recording programs show waveforms to give the user a visual idea of what has been recorded”. Then, you can add text, save, and paste your audio file. You can upload your entire podcast or just a small part of it, depending on your strategy. You don’t need to film your podcast in order to create a movie or a video clip that you can post and promote online. You can assemble graphics, images, and text with online tools such as Wavve, Animatron or Adobe Spark, which allow you to edit files, use templates, or add stock videos as well. Here’s an example from one of Buffer’s podcasts. They also have a video that was posted on Facebook in order to promote the same podcast. Over 1 billion people are members of at least one Facebook group. It is a huge audience that you can engage actively in your marketing strategy. You have two options. The first takes a little research. You will have to find relevant communities, join their groups, and engage with your peers. Some will allow you to promote your podcast while others will not. However, they are all great for self-promotion and building influence. Also, you can meet interesting new people as a member of these groups. Some of them will prove to be influencers in your industry, professionals you can talk with perhaps engage around influencer marketing as well. The second option is to create your own group, and this is where you should invest most of your Facebook Group-related efforts. Here, you will have complete freedom to promote your links, share news about your podcast, and talk with your fans and friends about topics, guests, strategies etc. Many marketers say that Facebook is their most important social media marketing platform, with over 90% of them investing in Facebook ads. There are a lot of guides available online that will teach you how to engage in advertising, like this one, so I won’t get into details on exact steps, costs, designs, etc. What I will highlight is the fact that Facebook and Instagram are now linked together via Facebook’s advertising platform, which includes both these channels. That means you can expand your strategy to two of the most popular social media platforms and target both audiences. Instagram allows you to publish ads within stories in a full-screen format, which should be also an option to consider, since this is the only place where you can publish these types of ads. Are You Using Facebook in Your Podcast Marketing Strategy? Podcasting represents one of the most popular trends in today’s content marketing field. Social media plays an important role as well. You can combine these two channels and achieve great results n the long run should you engage in both, social media and audio content marketing strategies. Being the most popular social media platform, Facebook is probably the first channel you should think about when you sketch-up a podcast promotion strategy. This article provided you with some of the best options you have and a few relevant examples of people who understood how to use Facebook as a tool, and not just a channel. How many of these podcast marketing strategies are you using? Are there any other options that were not covered in this article that you are aware of? to stay tuned for more. Thank you for this. There is SO much valuable info here. I will refer to this post a lot in the near future. Thank you so much.